A new concept in scissor technology. MicroPoint(TM) scissors can be used for suture or tissue, and they are manufactured without rings which eliminates the problems with right handed or left handed users. Scissors do not cut by cutting. They cut by shearing. Micro model – Lengths: 5¼" and 7¼"
Micro model – Blades: ¼" and ½"
Standard – Lengths: 5½" and 7½"
Blunt/Blunt Straight blades.13 mm cutting edge. Curved with 7mm cutting edge. Extra fine tips. 3" (75mm) long. Available in a 3mm and a 5mm cutting edge. Uncompromised slip resistant with automatic tissue manipulation. Up until now, you were faced with two choices in tissue forceps: rat toothed forceps that hold by penetrating a small zone of tissue, or serrated forceps that grasp by inadvertently crushing a broader area. Somehow, both can lead to microvascular damage. Pressure controlled Lasner-DaMan Tissue Forceps virtually eliminates the penetration or crushing of fragile tissue while providing uncompromised slip resistance. Micro Forceps/Tweezers are designed specifically for applications in the field of microscopic science. 1. Micro Forceps MF-1, Straight, Smooth or Serrated Jaws. Features extra delicate tips for general precision work. 100mm (4.0) in length, tips 0.5mm wide. Especially designed for precise handling in areas of limited access. Very delicate. 100mm (4.0) in length; 0.5mm width in tips. Made from all stainless steel construction. 20 gauge stainless steel, with a 3 mm cutting edge. 20 gauge stainless steel, with 3 mm tips. 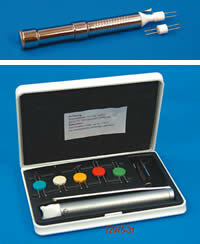 The cautery comes with fully changeable tungsten carbide tips and batteries. Dual power: 1 "AA" battery for lower power and 2 "AA" batteries for higher power. Generates 500 to 520°C. Set includes cautery handle and tips. Generates up to 1000°C. 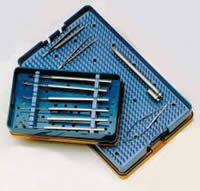 Set includes cautery handle and tips. Both medium and high temperature models take the same replacement tips. A perforated tray that comes complete with a silicone mat and a unique locking feature. A unique tray that allows you to place up to three diamond knives at one time in the autoclave. Protects the knives from any movement or damage. 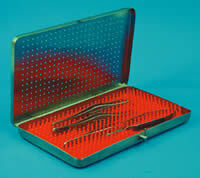 Has flexible silicone mats which offer flexibility to layout the instruments for sterilization. A unique "grid" system exists in the base, tray and lid, making it easy to install the mat required, protecting yours instruments properly. The trays are stackable and they have integral feet in base and corner ridges on lids which allow for easier handling in the autoclave and for storage. 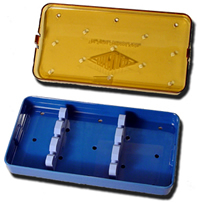 These trays are specially formulated to allow pins to stick firmly and be easily removed. They are made using a completely environmentally safe wax product, instead of the "black wax" product used in most dissection trays. Blue wax contains no toxic chemicals, and no fire, health or reactivity hazards are associated with it. 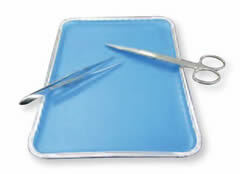 Blue wax can be heated to renew the surface and the dissection tray can be reused several times. It measures 9½" (L) x 7" (W) x 1" (H).